JRRshop.com | Mogami Gold 8 TRS to TRS Audio Snake Cable - 20ft. Mogami Gold 8 TRS to TRS Audio Snake Cable - 20ft. Virtually every major recording facility in the world is wired with Mogami cable. 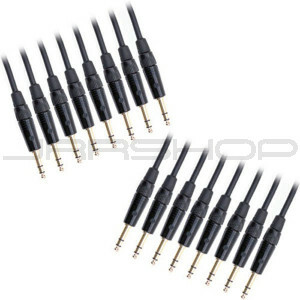 It is famous for unmatched accuracy, extremely low noise, and remarkable flexibility. Top engineers rave about its amazing clarity and silent background. If accuracy in reproduction is your goal, this is the cable for you. 8 channels terminated with gold contact balanced 1/4 TRS connectors. Channels are individually shielded with numbered jackets. Assemblies use top quality XLR and TRS connectors.